Andrea's World Reviews: Ninja Coffee Bar Review & Giveaway!! With the holidays right around the corner, the season of hosting begins. In the next few months there will be parties galore. From Thanksgiving dinner to baking and wrapping parties to surprise family visits to Christmas dinner and much more leading up to the new year. Entertaining can be so much fun, but it can also be stressful, especially when it is spur of the moment and you are not as prepared as you would like. One of the biggest struggles I have found with entertaining is that not everyone likes the same things. One thing that is a staple at all of my gatherings is usually the most "controversial". That would be Coffee. Some don't like coffee, in which case, they just pass. That's the easy part. However many love coffee. Sounds easy right? Well, not when they love it a specific way. Coffee addicts, like myself, are usually very particular about their coffee and are disappointed when the host/hostess makes it "wrong". As a hostess and a coffee lover, that is the last thing I want to do. But when some people like it super bold, some like it mild and others like it iced or "specialty", what is a hostess to do? Finally there is an easy solution. The Ninja Coffee Bar is the do-it-all coffee system. It is like a coffee shop on your counter top. The Ninja Coffee Bar can do it all. You can you choose a brew size; cup, travel mug, half carafe, or full carafe. You can choose the boldness of the brew with settings for original brew, rich brew and brew over ice. You can even get concentrated espresso to make specialty beverages. Since I pretty much exclusively drink iced coffee and specialty drinks, that was more than enough to make me fall in love with the Ninja Coffee Bar. I have always made iced coffee at home, and it never compares to a coffee shop for one reason, it is hard to get the concentrated coffee to start with that compensates for melting ice. My iced coffee would always get watered down too quickly. The included easy milk frother makes it super easy to create coffee house beverages. There are so many other features put this over the top. I love the stop brew feature, so I can can pour mid brew if I just can't wait. There is a 24-hour delay timer, so my husband (who gets up for work at 4am) can wake up to fresh coffee to start his day. The precise temp warming plate keeps the coffee at the perfect temperature too, so if he wants a second cup it is already done and waiting, nice and hot, for him. This has an easy fill brew basket and a permanent filter which is super convenient. Who wants to fuss with filters over and over again? It looks great on my counter top and and is so simple to use. Everything can be done with a touch of a button. Best of all, everyone can get what they want. Now my parties will better than ever. I had my sister and her boyfriend over just last night and we were all able to have just the drink we wanted, and it was even easier than a tradition drip coffee maker. It was so fast too. We were able to get right back to our movie in just a few minutes, all happier and more caffeinated. 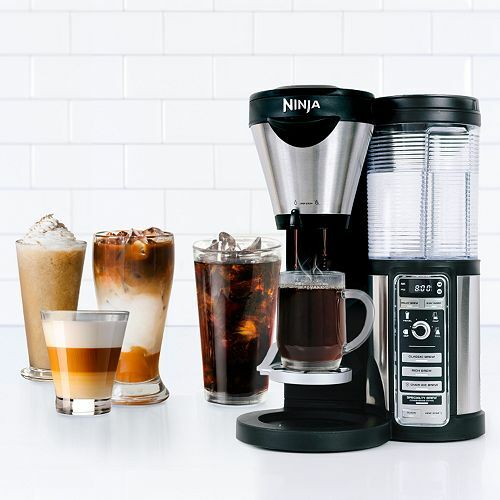 I cannot wait to use my Ninja Coffee Bar for my Thanksgiving and holiday gatherings. It will be so wonderful to know that all my guests are getting what they really want. I never want people to settle when they are guests in my home. There is no fear of that with the Ninja Coffee Bar. I never dreamed I could make such amazing coffee creations myself, but everything I try comes out fantastic. You really cannot know how great the Ninja Coffee Bar is until you try it. Luckily one lucky reader will be able to do just that. Ninja has been generous enough to giveaway a Coffee Bar to one very lucky entrant. Simply enter the Rafflecopter below for your chance to win this amazing prize. Good luck. Coffee taste depends on the quality of coffee beans. Coffee beans are very important to make a healthy coffee. Oceana coffee shop use best Coffee Beans for making coffee. I love coffee and have gone through quite a few coffee makers at home. One thing I really like about the Ninja Coffee Bar is that in the morning I can brew the coffee directly into my travel mug, grab it and run out the door. Organized and details review. Love it. Thanks for share it. Awesome post.I really like it.Thanks for sharing such a valuable post. On the off chance that you need to make the most of your amusements with no limitation at any hour of the day; it regards download 3ds emulator android. It can help you to stay tuned to your most loved amusements notwithstanding when you are far from your reassure.